Light and Shadows Cowl | Domesticated Human Light and Shadows Cowl | Online home of Crystal Flanagan. Knitter, spinner, sewer, weaver, canner, baker. Online home of Crystal Flanagan. Knitter, spinner, sewer, weaver, canner, baker. 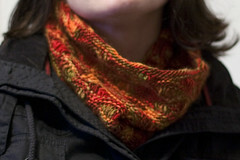 An easy and quick winter cowl knit with one hank of luscious Malabrigo. So easy it almost doesn’t need a pattern! The dropped stitch pattern creates an interesting blend of light and shadows, as well as showing off variegated yarns and helping to ease out pooling. View more pictures and projects on the Ravelry project page.